Haus der Kulturen der Welt, Berin Germany, Installation view. Recently reading Walter Benjamin’s ode to the city of his birth, ‘Berlin Childhood, circa 1900’, written in the early 1930s in exile and extensively revised in 1938 whilst Benjamin was being persecuted by the Nazis, I was struck again by the many contradictions of this great city. In few other world cities does one experience so visibly the layers of history and trauma, at the same time that a palpable sense of healing, hope and possibility pervades. Berlin wears its scars like a badge. Berlin’s status as the de facto contemporary art capital of Europe is due mainly to an influx of international artists that has escalated since the nineties following the fall of the Berlin Wall. Cheap living/working spaces and liberty provided endless possibilities for creative life in all its manifestations and played an integral part in the rebirth and regeneration of the city. A creative life where the lines blurred, so thatfound space, artist’s studio, informal gallery, bar and techno club led from one to the other, is a familiar Berlin story of independence and makedo. Alas, it is a phenomenon that is disappearing. One senses a certain nostalgia for those heady times, as the city and its art scene mature andsettle into more established ways. Now real estate developers dominate the new urban fabric and commercial galleries determine more and more of the contemporary art agenda. The recent Berlin Art Week reflects these changing times. It was established by a group of powerful art dealers in the city also responsible for the annual Gallery Weekend in the spring. These two events have become major bookends in the seasonal Berlin exhibition cycle. At the heart of Art Week is Art Berlin Contemporary (ABC), an art fair attempting to break with the expected format. Established as an alternative, and in opposition, to the existing contemporary art fair, Art Forum Berlin was actively boycotted by many Berlin dealers in 2008. Negotiations for a merger failed, and Art Forum’s organisers, Messe Berlin, threw in the towel in 2011 exiting the art fair business for the foreseeable future. In the space left by Art Forum Berlin, Berlin Art Week attempts to bring a large number of events, exhibitions, two art fairs (ABC and the rather poor quality Preview), and a couple of the obligatory Berlin parties into some kind of programmatic order. Many major public institutions in the city participate, though perhaps only using the platform for marketing purposes. A cynical view would be to describe it as opportunism by the organisers to gather a disparate array of unrelated events under the umbrella of a self-serving brand. ABC’s successful and refreshing attempt to break the art fair format is based on a simple premise – doing away with the usual scheme of small booths carving up a large venue into tight grids and claustrophobic alleyways to herd collectors along. Instead, participating galleries are invited to present works by a single artist. These are then considered curatorially, and a design developed to present works as a largescale exhibition. Two South African galleries, Stevenson and blank projects, both with a strong presence, joined a rather thin international representation (sixty-six of the 129 participating galleries were Berlin based, and only fifteen were from outside Europe). Stevenson presented new works by Dutch photographer Viviane Sassen, stark portraits that received much interest. Blank projects marked their debut at an international fair with a carefully considered selection of minimal works by James Webb, executed with the usual precise elegance the artist is known for. Inside the cavernous space of Station Berlin, without any walls or clear separation from other artists or galleries, an installation of five works occupied blank’s allocated space. Perhaps ‘occupy’ is a strong term to describe the ephemeral and intangible nature of the pieces, held together by an internal tension: a sound piece of birdsong (calls of a Cape Robin) echoed through the venue, an iteration of an ongoing project titled There’s no Place Called Home (Berlin); a plinth in a central position displayed a simple Ikebana flower arrangement, commissioned from a Berlin-based master of the art, using plants alien to and invasive in Germany; a neon sculpture based on Cape Town graffiti; a mirror balanced against a ledge with the text ‘Know Thy Worth’ in Arabic script; and a light bulb suspended from the rafters flashing a message in Morse Code. The week’s activities were aimed at bringing international visitors to Berlin, and showcasing its unique scene in an attempt to grow an art buying audience in Berlin, which has a notably small art market in relation to the glut of commercial spaces in the city. However, from my experiences visiting the fair twice, once at the preview and later during the weekend, attendance seemed low and a number of gallerists expressed disappointment with slow business. Whilst the strong programme of ABC and its astute curatorial vision are commendable, perhaps future additions will have more international impact and attract the numbers that will make it viable. The institutional exhibitions promoted by Berlin Art Week offered some gems, including the luminous Between Walls and Windows: Architecture and Ideology curated by Valerie Smith, head of visual art at the Haus der Kulturen der Welt (HKW). The exhibition consisted of ten installations and interventions in the iconic high modernist HKW building (formerly Congress Hall) bequeathed to the people of Berlin by the USA in 1957 (a symbolic ideological manoeuvre given the importance of Berlin in the escalating Cold War politics of the era). Each work was in critical conversation with its location in the complex. enter through any door in the exterior, restoring the original sense of the publicness of the building. Its magnificent soaring curved concrete roof, supported at only two points, belies a traumatic history, as it collapsed in 1980 (its engineering and construction in the mid fifties were considered radical, and generated tension between the German and the American teams regarding its viability). A sculptural installation by Ângela Ferreira was placed against one of the two supporting beams of the roof, its Achilles heel so to speak, and drew a parallel between its collapse and the more recent implosion of an unfinished concrete tower in Maputo, sabotaged by the Portuguese as they left the city at the dawn of Mozambique’s independence. A large video screen with looped footage of both events and an overlay of text was housed in a sculptural construction, mimicking the grand exterior staircase leading up to the entrance of the HKW. 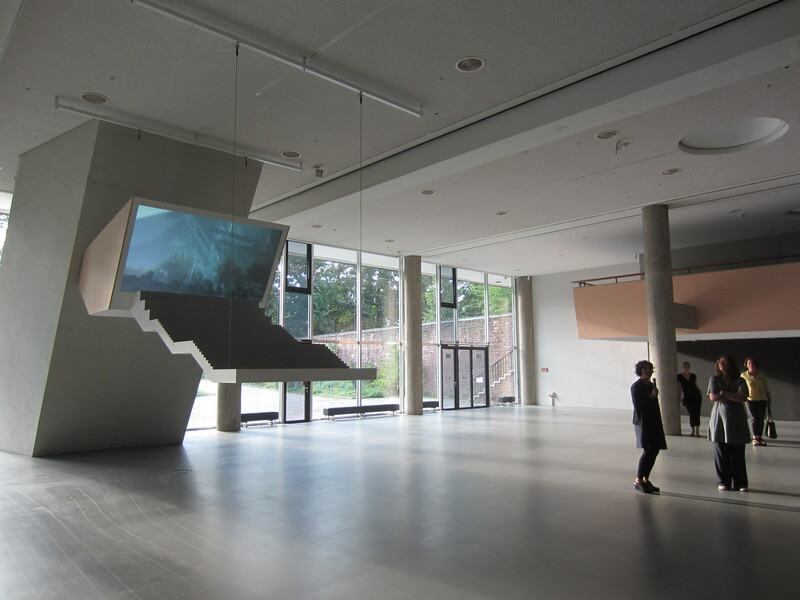 As with other installations in the building, Ferreira’s was the only work in the large exhibition hall of the HKW, but the sensitive curation by Smith made the building and its contents sing. The KW Institute for Contemporary Art opened its first solo project following the calamitous and controversial recent edition of the Berlin Biennale just before the advent of Berlin Art Week. The Egyptian artist Wael Shawky presented his Al Araba Al Madfuna as recipient of the Ernst Schering Foundation Art Award 2011. Shawky, whose epic film installations at dOCUMENTA (13) were a personal highlight, presented major works across all four floors of the KW. The artist’s new film was screened in the Institute’s large hall, which was filled with fine sand that visitors had to wade through to view the work. Based on a short story by Mohamed Mustagab, the film explores a small village’s gullibility for the tales of a seer. Two stories intersect – one narrated by adult men and lip-synched by young boys, and the other an enactment of a senseless digging for artefacts. The other major work by Shawky is the second part in a trilogy titled Cabaret Crusades: The Path to Egypt, which chronicles the Crusades from an Arab perspective. Beautifully filmed, the story is told through marionettes, and is a layered and dense exploration of events that still impact on social and political relations between the west and the Arab world. The comical and monstrous puppets were displayed in a monumental glass vitrine, magnificent to behold. It is important to mention the expansive three venue retrospective of Chilean artist Alfredo Jaar, The Way it Is. An Aesthetic of Resistance (hosted by Alte Nationalgalerie, Berlinische Galerie and the Neue Gesellschaft für Bildende Kunst) which just made it into Berlin Art Week, at the end of its run. The retrospective tracked early works and documentation and large-scale installations, with an interesting focus on works previously realised in Germany. It was perhaps Jaar’s large neon installation on display in the ornate shop front of Galerie Thomas Schulte in the upscale Mitte district that, with much irony, sums up the current Berlin mood. It states simply, in red and blue: ‘KULTUR = KAPITAL’. – I am indebted to the friendship and generosity of Daghild Bartels, art critic and writer, for her guidance and introduction to the Berlin art scene.